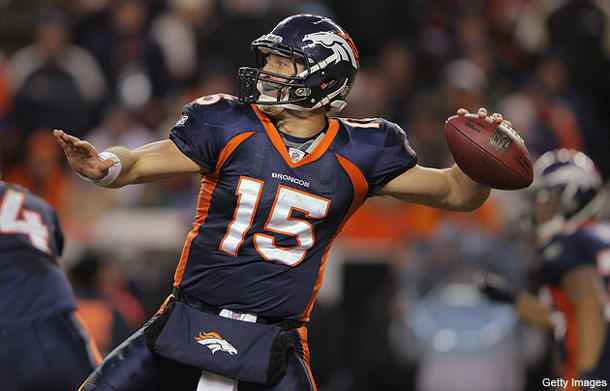 January 8, 2011: "I don't think Tim Tebow is a good NFL quarterback at this time." August 9, 2011: "One of the unique things about Tim is that he has that unique ability to make something happen when the play breaks down. That gives him a great advantage there ... but you have to win games from the pocket in this league. You can't rely on your improvising. That's one thing I learned. I was always going to make those plays outside the pocket, but that can't be your bread and butter." October 12, 2011: "Tim adds a great spark for us, so we're looking forward to seeing what he can do." December 12, 2011: "Everyone believes that something good's going to happen. And, obviously, Tim's been the guy that's led that thinking. He's just such a strong believer. He's really got everyone else believing if you stay strong, stay positive, something good's going to happen. When guys are thinking that way -- and it's been led by Timmy with that positive attitude -- all boats have been rising with that." December 21, 2011: "Tim Tebow's not going anywhere. I mean, he's going to be a Bronco and we're going to do everything we can and hopefully he's that guy." January 4, 2012: "The key thing for [Tebow] is to go out, put everything behind him, go through his progressions and pull the trigger. When you get into these playoff situations, he's a good enough athlete to pull the trigger." For Elway, there are two key questions. If Tebow is doing this well now, how much better can he be next year with an offseason of work not disrupted by a lockout? And how good will he be in three more years and thereafter? Ultimately, can Elway live without the Broncos having the prototypical quarterback that he himself was? If the Broncos make a strong showing in the playoffs, follow it up with success in 2012, and become Super Bowl contenders once again, with an ever-improving Tebow leading the way, he'll happily say yes to Tebow Time for the long haul. But still perhaps with a bit of well-hidden mixed emotions. I guess we will learn more this weekend when the Denver Broncos play host to the Pittsburgh Steelers in the 1st Round of the NFL Playoffs Sunday afternoon.